One of the most important, and neglected, aspects of a job search is defining the group of organisations you plan to pursue in your job search - your Target Market. To understand the value of defining a Target Market look at your job search project as if it were a sales and marketing endeavour. If you were planning to introduce a new product, you would first need to identify the group of customers who would most likely need and purchase your product in order to focus your sales and marketing efforts. You would define that group using demographic factors such as age, income, gender etc. Which organisations are highly regarded in my particular profession? Which organisations have cultures that are most compatible with my own values? Which organisations are currently working on problems and issues that are of interest to me and compatible with my skills? Carefully defining your Target Market increases your odds of more quickly finding an organisation in which you will be happy. Focusing on organisations you have handpicked provides the additional advantage that your authentic interest in these organisations makes you a more appealing candidate. Many people initially underestimate the number of targets they need for a successful search. Data collected indicates that the average person in search talks to 20 to 30 different hiring managers. If your Target Market is not large enough, you stand a chance of reducing your odds of success. On the other hand, having a Target Market that is too large can also present problems. People with hundreds of possibilities often run a search that is too diffuse and difficult to manage. Tip 2. Where will you be happy working? 1. What organisations are likely to be interested in someone like me? 2. What organisations am I most interested in joining? Focusing your efforts on organisations that are most likely to be interested in someone like you increases your odds of landing a job more quickly. Focusing on organisations you like increases your enthusiasm in the job search and, ultimately, the odds of you having greater satisfaction in your work. Once you have defined your Target Market, you need to make a list of the top 20 - 30 most desirable targets in that market. A clearly defined target list focuses your search by helping you to organise your day-to-day activities. 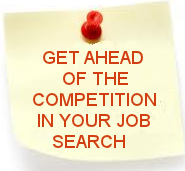 People effective in their job search are always researching, talking to and talking about their top targets. They constantly improve and refine their target list, taking out less desirable targets and focusing energy on the most desirable ones. All experts in job search agree that informal conversations or simply talking to people is the single most effective way of locating appropriate new employment. What exactly do you say when you are talking to your contacts? Simply telling them that you are unemployed and/or looking for new employment might limit the conversation and make your contacts uncomfortable. However, making your target list the central topic of your conversations is not only useful to you it makes your contacts more comfortable. Your contacts are usually happy to talk about organisations and give you their opinion, especially ones where they have personal experience. Having conversations about your targeted industries and companies – and their issues and opportunities – can prove to be highly productive for you. It is a very good way to augment the information you have acquired through your own research. It can also sometimes lead to introductions or referrals to new people. Through your research, hard work and diligence, you have obtained the name of a hiring manager at one of your target companies and have secured a face-to-face meeting with them. Now your work really begins – you have one chance to really impress the hiring manager and that’s where the SELL approach is particularly useful. Although you might think of the meeting you have just secured as a networking opportunity it is very different from general networking meetings. This meeting needs to be thought of as pre-interview meeting because sooner or later the company will have a need and you need to position yourself as a prime candidate. Using the SELL approach will ensure that you are fully prepared to make that all-important good first impression. Summarise your message – Refer back to the career transition work you have undertaken so far – for example, your career objective, personal profile, positioning statement, exit statement etc. Explore their needs – Collecting further information about the needs of the targeted company and of the hiring manager is central to this discussion. This information will enable you to be even more effective in your continuing pursuit of the company, both in the meeting and after it. Link your benefits to their needs – Wherever possible, mention the competencies you have that fit the needs of the company. Leverage a next meeting – Use information obtained in this meeting to arrange a next contact. The SELL approach actually provides you with an agenda for your meeting with the hiring manager. Assuming the meeting to be 20 to 30 minutes in length, below is a suggested time allowance for each segment. Your initial message about yourself should position you as someone who would be an asset to any company but with special emphasis on any competencies or accomplishments that are relevant to the needs of this particular company, based on what you have learned so far. Your research and analysis of the company may have led you to conclude that your skills and experience match their needs. However, before you try to convince the hiring manager of that, you should be sure you correctly understand all of the needs – as well as the hiring manager’s perspective on them. You should prepare relevant questions in advance and ask them early in the meeting. And then, you must listen. Listening is the way you will get the information you need to recommend yourself as the solution for their needs. Smile, nod, stay focused and let the person know you are hearing what they are saying. Summarise what you believe are the main points presented by the hiring manager. Ask for confirmation that you understood correctly. Above all, listen and connect. Do what you can to build a relationship. Once you have a better picture of the company’s or hiring manager’s needs, you can better describe yourself as relevant to those needs. Now is the time to embellish the brief summary you used at the outset. Select competencies and accomplishments that clearly connect to the needs you heard and confirmed. In your responses, reflect back some of the actual words the hiring manager used. This is where the research you have done and the information you are getting from the hiring manager comes together. This is when you begin to link your experience and skills to the needs that are being expressed. Building a relationship with the hiring manager is one of the most effective ways to be sure you are in his or her thoughts when an opening occurs. For this reason, you want to leverage a next meeting with the hiring manager, or at least find a way to continue the conversation begun in this meeting. Throughout the meeting, you have been looking for shared interests that might give you a reason for another meeting or a follow-up contact. You can do this by making an offer of additional information on a topic of interest. If possible, make a specific appointment for another meeting. If you are not able to arrange a meeting continue the contact by following up with the hiring manager in an appropriate way. A tip to remember: all meetings with hiring managers (in person or on the phone) should be treated as interviews and your preparation should be thorough. I would like to introduce you to a technique that will improve your interview skills and get you ahead of the competition. There are some interview questions that are predictable and you must know how you are going to answer these questions without spending precious interview time thinking for too long or waffling because you are not prepared. If you are not prepared you will not get ahead of the competition – simple! “Give me examples of the types of experiences you have had managing x”. Now, you might be wondering how you will fully prepare and remember all the important messages you want to convey. It isn’t so difficult if you follow a formula of developing stories that are easy to recall and can be articulated succinctly and quickly. The SOAR method has been tried and tested with positive results and I’m sure it will help you too. But before I describe how the SOAR method works you need to do some work to identify your skills/assets and your achievements. Once you have identified them you will use them to develop achievement stories for interviews using the SOAR method. If you would like help to identify your skills/assets and your achievements please contact me. Obstacles: Describe the obstacles you faced. Actions: List the actions you took. Results: Describe the results you helped obtain and the benefits to your employer. Using the SOAR method you can prepare 10 to 20 achievement stories based on commonly asked interview questions. Check out my other blogs for sample interview questions and other useful information. Ideally, an interview is the result of your having carefully selected the organisation based on your research and conversations with insiders. Now is the time for your final check. Is this really the right job for you? Check out these Four C's to help you to decide. Can you do the job? Do you have the ability to perform the specific functions of the position effectively? You may want a job that stretches you a bit, but you do not want one you cannot handle. Even more important, are the competencies required the ones you want to exercise every day? Is this what you want to do? Can you do the job there? Will you relate effectively to the diverse employees in the organisation? How do you feel about the organisational culture? Is it consistent with your values? Do you want to work in a place like that? Can you do the job with them? Do you like these people? Do you like them enough? Chemistry is very important in a job, especially with your immediate supervisor and peers. All in all, are these people you will be happy working with? Can you do the job for what they will pay? This is always the last question in the process, since raising it too soon can create problems for you. But the compensation – in pounds, benefits and satisfaction – should certainly be a key item on your list. For many people a lack of confidence stops them from doing what they want to do or it can mean that they just dread doing things that cannot be avoided – such as securing a new job following redundancy. However, it is worth taking the steps required to build self-confidence as this has a massive positive impact not only in job search situations but in life generally. Use the power of body language e.g. stand tall, look people in the eye. Dress to look and feel your best. What do others value about you? Write down all the compliments you receive. Learn a new skill: prove to yourself that you can learn new things. Accept responsibility for your decisions. Stop complaining and take action. Believe the people around you want the best for you. Maintain (or attain) balance in your life. Whatever you’re doing, commit to it 100%. Your attitude about yourself, your thoughts and the way in which you communicate – that is to say, the words that you use – have an impact on your confidence levels, your self-esteem and how others perceive you. The more self-assured you are you will notice people around you will treat you in a different way. The more energy you exude people around you will notice that there is something different about you. Something really good. Our attitude – whether positive or negative – has an impact on our levels of confidence. You can choose to change the way you think: what you choose to believe will become your reality. You can change your attitude if you want to: for example: when you do something new or different and it doesn’t work out as you wanted, consider it a learning experience and not a failure. Positive attitude: by choosing to consciously think positive thoughts you begin to have these same positive thoughts unconsciously. Everyone has an internal commentary running in their heads, known as ‘self-talk’ or our chatterbox. If this is constantly telling you that you cannot do something or that it is too scary, you will believe it. Your inner voice will say things that you would never tolerate from someone else (‘you look awful in that suit’, ‘ there’s no way you could do that in a million years’, ‘who are you kidding’). The key is to reject these thoughts just as you would if someone else expressed them. Every time you catch your inner voice being negative, replace the thought with something positive. Your subconscious will believe these positive thoughts and as a bonus you will hear positive thoughts throughout the day. It takes practise and vigilance. Be aware of your language, the vocabulary you use affects how you feel about things. Try saying one of them out loud now. Many people have a tendency to paint a more negative picture than is necessary. How often have you said “oh I’ve had an awful day” when in fact you just suffered a small mishap? These over dramatisations have a similar effect to negative self-talk, you start to believe you live in a world full of awful things. By careful use of language you can shape your view of the world, of yourself and of how you react to those experiences. We all know that in today’s job market it’s fair to assume that it will take more time to secure a suitable new position compared to, say, four or five years ago. It’s no surprise that the number of applicants per vacancy has risen to a point that recruiters and hiring managers are pushed to their limits in managing and responding to applications received – often resulting in feelings of disappointment when your application isn’t acted upon or sometimes even acknowledged. As you would expect, the selection process is more rigorous and to top it there are emotional challenges that you may not have experienced in your previous job searches. It’s the emotional side of job search that I want to talk about today. How you handle the emotional issues that come up will have an impact on the more practical challenges of your job search. During this time of transition, you may experience any combination of reactions: shock, denial, anger, sadness, guild, anxiety, fear, relief, and maybe even excitement and anticipation. Everyone in job search can expect to experience some of these. Some of them are more acute at the beginning of a search although some or all of them may occur throughout your search project. Some people have described searching for a job as a roller-coaster ride; others as a bungee jump. Suffice it to say it is a time of incredible lows and highs, with, perhaps, concomitant mood swings. Keeping your emotions in check will come more easily to you if you take care of yourself. Self-care may seem rather indulgent although it’s probably the single most important thing you can do for yourself during your job search. Looking after yourself will help you to feel good and give you that bit of confidence to help get you to where you want to be. Ignore self-care at your peril. Emotional self-care. Enjoy supportive relationships with family, friends, yourself and others. Surround yourself with positive people and those that care for you. Nurture your relationships and learn to fulfill your personal needs – which may mean saying “no” to requests that don’t meet your requirements right now. Mental self-care. Focus your attention on your goals. Stretch and stimulate your mind through your activities. Set yourself time limits for your search activities, ensuring that you take regular breaks. Create a good balance in your life and always include things that are enjoyable, relaxing, inspirational and motivational to you. Physical self-care. Take regular exercise and enjoy a healthy diet. Don’t over indulge in your food or alcohol consumption. Keep headaches at bay with a regular intake of water. Avoid excessive caffeine and try drinking herbal teas daily. Purposeful self-care. Recognise what’s important to you and live your life with a sense of meaning and purpose. Spend time doing the things you most enjoy with the people you like to be around. Take time out to experience the outdoors or do something that you have wanted to do for a long time but could never find the time. A big part of preparing yourself for the interviewing process is being aware of the types of interviews to expect. In addition to an arranged, face-to-face interview with a hiring manager, there are other types of interviews you might encounter. Frequently a company will conduct a screening – or initial – interview to determine whether or not you should be considered more seriously as a candidate before engaging in a longer, more in-depth meeting. A screening interview can take place in person or by telephone. A Human Resources professional or a hiring manager (or even an external recruiter) might conduct it. Whatever the circumstances, it is still an interview and your goal needs to be to keep yourself in the running and be asked back for another interview. It is rare that an offer is made at a first interview so it is in your best interest to avoid or defer discussion of salary or benefits until you know more about the job and/or an offer is made. Telephone interviews are becoming a more common practice and can occur in a number of ways. As just mentioned, they can be part of the screening process as a way of speeding up the initial selection, part of a conversation with a contact or hiring manager that moves into a discussion of an opening, or a planned event when both parties agree in advance to speak at a future time. In all cases, you need to be prepared and conduct yourself as you would in a face-to-face meeting. From the employer’s standpoint, the telephone interview is effective for eliminating unqualified candidates with a minimum commitment of time and resources. For you, a telephone interview has its advantages and disadvantages. One big advantage is that you can work from notes and other written material. Screening interviews on the telephone can happen when you least expect them. If you receive a call that you perceive to be a screening interview and you are not total prepared or it is not convenient for you, explain that this is not the most opportune time and ask to reschedule the call. A telephone interview is just as important as a face-to-face one and you want to be sure you are prepared and not distracted. An experienced interviewer typically begins the interview with an overview of the job, a reference to your CV and perhaps an explanation of why you have been selected as a candidate for the position (i.e. identifying some areas of your experience that qualify you for the job). A telephone interview usually lasts between 10 and 30 minutes, with questions being asked about your education, job skills, technical knowledge and work experience. Group or panel interviews are meetings with more than one person at the same time in the same room (although there are occasions when they might be conducted by telephone or video conference). Group interviews are conducted for a variety of reasons: to allow all people involved in the hiring to interview you at the same time; to get a cross section of opinions; to see how you fit into a particular group; and to see how you handle talking with several people at the same time. A group interview requires that you adopt more of a presentation style to your answers and questions. Try to remember each person’s name and title (or ask for business cards before or after the meeting) and direct answers or questions to individuals as appropriate. Maintain good eye contact with each person when answering questions. Shake hands with all members of the group when entering and leaving the interview, and send a follow-up letter to your primary contact, acknowledging the others in attendance. A major part of your interviewing strategy is being prepared to answer even the most challenging questions in a manner that demonstrates why you can do the job. What aspects of your last job relate to this position? What contribution do you think you could make to this company? To start, I would like you to tell me about the parts of your background that qualify you for this position. What type of activities were you involved with in your last job that successfully used your management skills? Be specific. Tell me how your background qualifies you for this position. Give me examples of the types of experiences you have had managing people. In as much detail as possible, tell the ways you used team building skills in your last job. What would your ideal career position be? Where would you like to be in three years? In five years? If you could begin your career over again, what would you do differently? What important career goals did you set and reach on your last job? Exactly what were they and what were the results? Tell me about a time in your working history when you prioritised your career goals successfully. Career goals are often made to meet the expectations of a career management system. Tell me about a time when you took the initiative to set career goals and objectives, even though you were not directed by anyone to do so. What formal education or training have you had? What part of that education or training prepares you to do this job? What was the most important programme you completed over the last year? Tell me about a time when you used your education and training. Pick a technical problem you had to solve, give the details involved in it, and tell me about what you did to create the solution to that problem. Do you think that you might be overqualified for this position? What is the most serious criticism you have ever had from your boss? Give me an example of a time when your biggest weakness at work kept you from reaching an important objective. Describe a time when you didn’t work as hard as you could have. Give me an example of a time when you became bored with a project. Pick an example from your current job that would reflect on your ability to deal with pressure. This job will require you to work as part of a team of diverse backgrounds. Describe a time when you were not effective in managing a conflict at work. Individuals vary in their ability to use power to influence others. Give me a specific example of a time when you used power and it backfired. What did you dislike about your previous job? If I spoke to your present/previous manager, what would that person name as your greatest strengths and your greatest weaknesses? Are you opposed to drug testing? Tell me about a time when your work was criticised. Tell me about a time when you were not successful in coping with a pressure situation. Tell me about a time when you were not successful in adapting to change. Give me an example of an incident when you had a serious disagreement with your boss. Many books on interviewing will say that toward the end of a traditional interview, you will be given an opportunity to ask questions. However, a better way is to look for opportunities to ask questions throughout the interview. The interviewing process involves two-way communication. It is just as important for you to ask – as well as respond to – questions. Asking the right questions serves two purposes. First, it is the way to get the information you need to match your qualifications to the requirements of the job when answering questions. Second, it is the way to get the information you need to evaluate the position and make a decision as to whether it is the right one for you. There are five significant areas you need to ask. The subject areas are listed below, along with the kinds of questions you can ask. Asking these questions throughout the interview increases the probability of a more interactive dialogue. NOTE: Not all of these questions are appropriate to ask of all companies. You need to match the questions to the organisation based on what you know about it. Does a job description exist for this position and, if so, may I see it? Beyond the job description, what are your expectations? How long has this position existed in the organisation? What would be the next career progression? What situations need immediate attention? What qualifications do you expect the successful candidate to have? Can I meet the people who work in the department? What experience, training and tenure do the employees in the department have? Does the company provide training & development programmes? Does this department have its own budget? What is the budget and how is it administered? What interdepartmental or corporate support is available to accomplish the department’s targets? Who would I be managing in this position? Where are the reporting lines? How long has the manager of this position been with the Company? What is the manager’s experience and training? What are the established policies and procedures for making decisions in this position? Are the departmental policies and procedures documented? What would be the extent of my authority to carry out the responsibilities of this position? Would I have the authority to hire/terminate employees in order to accomplish the targets? Would I have direct input for the department budget? Would I be totally responsible for developing the budget while in this position? Which of my decisions would require approval? Who would approve? What are the short – and long-term goals/targets of the position, and how are they established? Has the position been evaluated by some established means? Do you have a performance appraisal system? How does it work? How is performance measured against the goals/targets of the department? What is the most important contribution you would expect from me during the first six months? How would successful performance be rewarded? How often is performance reviewed in this position? How would you describe the organisation’s management & leadership style? Is the company environment formal or informal, structured or flexible? Do you operate in a centralised or decentralised manner? Can you describe the interdepartmental relationships? What has the turnover rate of the department been? Are there any internal candidates being considered for this position? Can you do the job? Do you have the ability to perform the specific functions of the position effectively? The interviewer is looking for evidence that your experience, skills and competencies match the position and the organisation. Can you do the job here? Will you relate effectively to the diverse employees in the organisation? You will probably have several interviews with the hiring manager as well as others in the organisation to determine your compatibility. Can you do the job with us? Do they like you enough? Do you like them enough? Interpersonal chemistry is very important in the selection process. Even if you are the most qualified person on earth, there needs to be the feeling that they like you enough to spend a minimum of 37 hours a week with you – and vice versa. Many years of experience has shown me that there are a lot of people in careers that don’t fulfil them or make them happy. But when asked what they would like to do instead it’s clear that they just don’t know. Does this sound familiar to you too? Perhaps you have, like many people, until now left your career to chance – you may have said or heard others say “I just fell into my job”. And for some people that works well and is just fine. However, if it doesn’t work for you then it doesn’t have to be this way. With some thought and dedication you can find career options that suit your personality, interests and strengths. It’s never too late to make a change although it does require you to take action – simply making a decision and sitting on it will not get you to where you want to be any day soon. So, planned, focused action is the order of the day! The first thing to recognise is that in order to make the right career choice you will need to go back to basics and remind yourself of who you really are and what makes you tick. You will need to explore and rediscover the things that are important to you in your career and home life, your interests, your strengths, skills, experience and personality traits. Your work is going to fill a large part of your life and the best way to find satisfaction in a job is to do what you love doing. Funny thing is that when we do a job that we love we find we are not only good at it but it doesn’t feel like work at all! I’d say, it’s worth your effort and time to get to feel this way. So, go explore and discover the right career for you. These 5 exercises will get you started…. A value is something to which you attach importance. They make you who you are. Values are essentially subjective because it is you alone who accords significance to your values. Here are some typical values: fairness, integrity, commitment, achievement, contribution, faith, peace of mind, honesty, respect, security, status, openness, environment. Our values are the often-unconscious drivers that underpin all our responses, actions and decisions. When we are honouring our values in our daily lives, we feel congruent and at peace. When we are not, we can feel uneasy and unfulfilled. As adults grow older and accumulate life experience, their values often change. If you are 55, for example, your values may be quite different from those you had at 25. Your values are a product of your temperament and experience. With that experience you can also prioritise and discard values as circumstances change. Re-examining your values can be an important part of making a successful career transition. And when you design your life and career based on your values, your motivation will greatly increased and your chances of success and fulfilment improve hugely. Identify your Top Five Values and refer back to these as you explore your career options. Research has shown that different personality types tend to have distinct preferences in their choice of careers. Perhaps pretty obvious but it makes it important to learn more about your personality and come to a better understanding of your likes and dislikes, your strengths and weaknesses. You can visit www.personalitypage.com and for $5 you can undertaken an online self-assessment which considers different career choices depending upon your personality along with some suggestions for possible directions. The learning from this self-assessment will help you make the right career choices and if you have the opportunity to share this with your coach or mentor then you will gain even more insights. When we do what we feel passionate about, we lose ourselves, feel totally motivated, and often do it very well. This exercise will help you identify what you’re passionate about. How do you use your leisure time? What did you love doing when you were aged 7, 13, 18, 24? What were you doing when you became so absorbed that you didn’t notice the passing of time? Select those interests and passions which have the potential to get your pulse racing today and use them to guide your career direction. WWW.Strengthsfinder.com is a really useful website that partners the book. “ Now Discover Your Strengths”. There is a self-assessment that helps to uncover your top 5 strengths. Information on careers which may suit each of your 5 strengths is provided along with ideas for action. The self-awareness you gain from the self-assessment can form the basis of a great career discussion with your coach or mentor. Having come this far you will, hopefully, have lots of ideas and information in your head. Well, here is an idea for a way to bring all of that together. This is a space where you can capture any career possibilities that come up throughout the next few weeks. Ideas can come from magazines, the internet, words and songs that inspire you, photographs, job boards, childhood ambitions, hobbies and interests – be creative and get involved. Be sure to include all ideas that you are reminded of from time gone by. You are going to create a New Ideas Bank in the form of a box or other container, a folder, binder, a scrap book, vision board, collage or anything else that works for you. Put in the Bank all the ideas you have had from magazines, the internet, words from songs, photos, job boards, recalled childhood ambitions, hobbies and interests. Be creative and non-judgemental. However mild, however wild the ideas – do not judge them but just put them in the New Ideas Bank and when you are ready you can look for patterns and pull your ideas together into work themes. It will help you identify your new career direction and options.